Have you ever worked remotely?! If you didn’t, then you are one of the rare people since today remote work became a common practice and a game changer for the global business. Many businesses found themselves having to alter their technical policies, but is it worth? 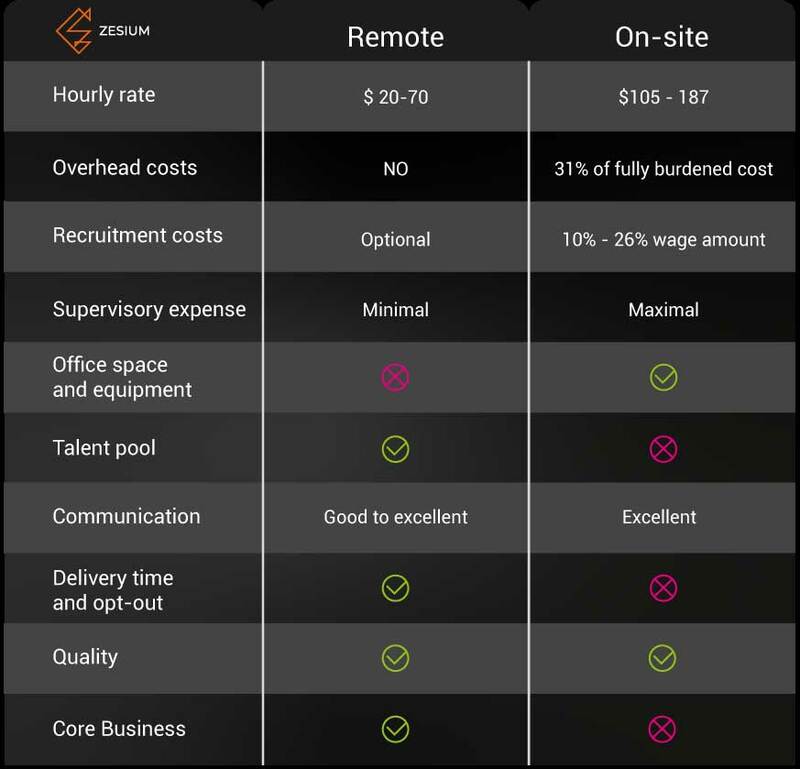 First, let’s check the numbers when talking about remote employment. The recent research by Gallup in 2017 found that the percentage of employees working remotely increased from 39% in 2012 to 43% in 2016 and indicates that this number will to grow up to 75% by 2020. While 90% of Millennials, Gen Xers and Baby Boomers have accustomed to working remotely, it is 60% of Millennials that take the full advantage of remote work options as opposed to 33% Baby Boomers. The worldwide outsourcing market has already surpassed $524.4 billion back in 2015 with IT being the largest sector outsourcing and according to Deloitte’s 2016 survey, there are more factors which you should consider regarding IT outsourcing apart from the cost reduction. 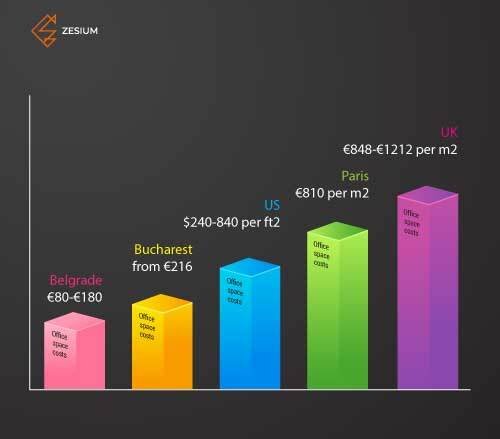 To better understand why outsourcing is profitable, you need to know the differences between annual average salaries of software developers in Serbia compared to annual earnings of US and UK software developers. As per Accelerance 2018 Guide to Global Software Outsourcing Rates, here are the average hourly rates for developers (junior, senior or lead) in USA, Latin America, Asia and the Eastern Europe. Always bear in mind that hourly rates shift per country, local economy standard, job positions and other relevant factors according to Accelerance The 2018 Guide to Global Software Outsourcing Rates. The burden rate provides a clearer picture of total labor costs than the payroll costs alone. The fully burdened cost of an employee includes payroll taxes, workers compensation, health insurance, paid time off and so on. According to the Bureau of Labor Statistics, the average cost of the employee benefits is 31% of an employee’s fully burdened cost. When outsourcing, the burdened costs don’t exist – it gives you an opportunity to invest saved money to the other segments of your business. Recruitment agencies’ fees aren’t so moderate depending on the target country. In UK and USA, the recruitment fees rise as the wage increases. For example, you will be charged around 13-15% for roles up to £15,000. If you are seeking a job profile with a salary up to £20,000, then your fee would be around 17-18%, and anything above the £20,000 salary can be between 22-26%. However, outsourcing allows you to get similar services at a lower cost. Even better, you can hire the services only for a specific task whilst in-house developers are continuous cost regardless requirements. Outsourcing software development gives you flexibility to manage your resources and scale them quickly but if you need to grow your in-house team, you have to repeat the entire HR drill and there’s always a chance not to get the desired result. Management time is not free – for each new person you hire, managers need to spend additional time on one-on-one meetings, coaching, managing reporting and so on. Many staff members would be involved (managers, HR team etc.) and you may face a loss of productivity from both sides. For many companies, new employee onboarding can be a disruptive activity of the week which means you have to spend more money to get them working. In USA, the price depends on the city and the location while in UK, the office space depends on the location, office size and type of lease (serviced, rented, freehold etc). In Belgrade, for example, you can rent fully furnished office space from €80 going to €180 for the luxurious office building with all additional facilities (warehouse, garage, separate offices, etc.). Don’t forget that your team will also need computers, storage, testing tools etc. which your company must buy so you must consider this cost as an add-on to the office space rental fees. Since hiring in-house developers for all technologies is not practical, if you need specialized service the best choice would be to outsource – you would have access to a diverse talent pool since software development companies that outsource have every type of talent on their hands. Outsourcing provides you with unlimited access without paying anything extra. More importantly, outsourcing development companies work across various industries so they have more industry knowledge since they have to keep the pace with the technology updates whereas in-house developers may be limited to a particular industry and may get the feeling that they are stuck with whatever they are doing. It’s believed that companies that outsource often deal with employees that speak little or no English. But today, finding a team with a project manager that’s fluent in English isn’t a problem anymore since those skills can be easily determined within an introductory call. Considering ‘remote’ communication, people say it’s easier to talk to a person sitting nearby. But let’s face it – we’re more keen on digital channels and even if sitting close to each other, we’ll communicate via chat (Slack, Google+, Skype etc.). A good quality communication can be set up through digital channels, regular sprint planning or retrospective meetings, tools that enable remote collaboration (Jira, Taiga or Trello) and making stand-ups online a common practice. When communicating remotely, you should always tend to over-communicate. Maybe it sounds silly, but communicating via text lack many physical cues such as body posture, tone of voice etc., so to avoid any misunderstandings, video meetings are excellent choice to get around communication barriers. When you hire on-site developer, you have to pay the costs no matter his performance results while with outsourcing development company, you only pay upon delivery. A competent outsourcing company will improve work accuracy within given deadlines on a project plus it will deliver desired results in less turnaround time. Great outsourcers would offer you valuable innovation consulting, identify advantages or risks, give suggestions for better execution, help you finalize software specifications and even more. Don’t forget, the best outsourcers always focus on establishing a long-term relationships with their partners. However, if your in-house projects aren’t delivering, you can’t offload those employees unless after an agreed period. If you end up dissatisfied with the in-house recruitment, bear in mind that you may not be able to change things to improve your ROI. It’s true that you need to be careful with your choice as some outsourcing companies may offer lower prices but accompanied with a good chance of not delivering the quality you desire. To stay on the right track, consider a reputable outsourcer that has a demonstrated track record of high quality work. You should do a short research on the company by checking their background, how long they operate, previous client records, customer retention rate etc. You can also ask for code samples to verify if they deliver high-quality work as there can be huge difference in the quality of work. Quality control may be more flexible when employing in-house software development team but if you find a great outsourcer for your partner, the benefits are endless. A good business strategy would be to find a reliable outsourcing development company that can be your long-term partner while you can concentrate on the big picture and keep up with the technical changes and consumer expectations. Outsourcing software development enables strategic focus that can greatly benefit your business – when not busy managing financials, you can use the time for more constructive purposes. It’s also beneficial for your in-house IT team as it allows them to continue supporting other issues (network maintenance, cyber security, end-user support, etc.) that are critical for your everyday operations to run smoothly. Hence, what’s the final word? Globalisation’s been a buzzword for a few decades, but only now it shows its full potential – the world is shrinking and you can gain with it! Don’t allow yourself to dismiss the option of outsourcing software development as ‘too expensive’ because of incomplete comparison of outsourcing rates and internal labour costs. Mutual trust, respect, and teamwork – these three things are the main ingredients for a great recipe of client-developer partnership, and thus a successful outsourced development.